(1) Well before Obama took office on January 20 2009, the Missile Defense Agency had begun deploying a new version of Ground-Based Interceptor (GBI) that has a serious but unsuspected design flaw. In essence, the George W. Bush Administration had left the Obama Administration with a hidden, ticking (albeit slowly) time bomb that would ultimately wreck the GMD testing program. (2) This defective new version of the GBI was only needed in the first place, because, in its rush to meet a politically motivated deadline established by the George W. Bush Administration, the MDA had deployed GBIs that relied on non-sustainable parts. Moreover, the first operationally-configured interceptor was deployed more than a year before it was first flight tested and more than two years before its first intercept test. (3) The new version of the GBI also began deployment long before it had even been flight tested, much less intercept tested. (4) When the first flight and intercept of this new version of the GBI ultimately took place in early 2010, it failed. However, the MDA simply continued to deploy them as if there were no problem. (5) When the design flaw in the new version of the GBI was finally uncovered as a result of a second failed intercept test, its disastrous consequences for the entire GMD program became evident. It resulted in testing delays of at least five and a half years. It caused planned intercept tests to be cancelled. It cost over a billion dollars. To put this cost in perspective, at least four or five intercept tests could have been funded with the money that will ultimately be spent to demonstrate that the CE-II equipped GBI can actually hit a target. One need not look much further for the cause of GMD test delays and the reason funds have been “drained” from the test program. (6) Finally, the current slowdown in testing of the GMD system did not begin with the Obama nor did it coincide with large reductions in GMD spending. The slowdown began in 2007-2008, during the second George W. Bush Administration and at a time when spending on the GMD system was still relatively high. (1) Deployment of GBIs with the new CE-II (Capability Enhancement II) kill vehicle began in October 2008, beginning with the 25th GBI to be deployed. The 30th GBI was deployed in September 2010. Thereafter, additional new CE-II GBIs replaced already deployed CE-I versions on a one-for-one basis. The design flaw in the CE-II, which involved a component(s) not used in the older CE-I kill vehicles, was not discovered until sometime after the failure of the FTG-06a intercept test in December 2010, by which time ten of the new CE-II GBIs were already deployed in silos. (2) In 2002, President George W. Bush directed the Department of Defense to begin deploying an initial set of national missile defense capabilities by 2004. Deployment of GBIs began on July 22, 2004 when the first GBI was deployed in a silo at Fort Greely, Alaska. These interceptors were the first ones built to an operational configuration and were equipped with the original Capability Enhancement-1 (CE-I) version of the kill vehicle. The first flight test of a CE-I GBI was conducted on December 13, 2005 The first intercept test was FTG-02, conducted on September 1, 2006 (although reported as highly successful at the time, years afterward it was revealed that the interceptor had only struck the target a “glancing blow.”) Deployment of the CE-I GBIs continued until the end of Fiscal Year 2007, and a total of 24 were deployed. Although the 2004 goal for an operational capability was met, in the rush to deploy, the CE-I GBI interceptors were built with non-sustainable parts. Thus just a year after the first GBI deployment, MDA began developing a new version of the GBI. Then MDA Director Lt. Gen. Patrick O’Reilly told Congress in 2011: “However, we started a second version of the missile kill vehicle in 2005 based on obsolescence reasons; parts, manufacturers and so forth not producing parts anymore that – and the electronic systems that we needed.” The Government Accountability Office (GAO) states that the decision to develop and deploy the CE-II occurred even earlier, in 2004. While the development and deployment of this new CE-II version of the kill vehicle is often portrayed as a desirable step for the GMD program, one that improved its capabilities, this is not why it happened. As the GAO reports: “The CE-II EKV was not originally a reliability upgrade or a performance upgrade program. Its initial priority was replacing obsolete components. However, updating certain components is expected to result in increased performance.” As it turned out, updating one of these components would prove disastrous to the GMD program. (3) MDA began to deploying the new CE-II equipped GBIs before a CE-II kill vehicle had even been flight tested, much less intercept tested. The first flight and intercept test for a CE-II equipped kill vehicle was FTG-06, held on January 31, 2010, fifteen months after deployment of CE-II GBIs began in October 2008. (4) As noted in the point (3) above, the first flight and intercept test of a CE-II GBI was FTG-06, in January 2010. It was subsequently discovered that the test failed because a part was omitted during the assembly of the kill vehicle. (There was also a serious failure of the SBX radar during this test.) However, as discussed in (1) above, deliveries and deployment of CE-II GBIs continued. Deliveries and deployment of CE-II GBIs were not suspended until after the failure of FTG-06a in December 2010, at which point ten were already deployed in silos. Figure 1. Cost of establishing the capability of a CE-II interceptor to hit a target as of February 2012. Click on the figure for a larger image. Thus well over $1 billion will ultimately be spent demonstrating the basic operation of the CE-II GBI even if the next test, FTG-06b, is completely successful. To put this in perspective, the most recent test GMD test, FTG-07, held earlier this month, reportedly cost about $214 million (although the costs of investigating its failure will increase this.) In 2012, MDA told Congress that the planned future tests FTG-11 and FTG-13 would cost $206 and $191 million respectively. At roughly $200 million each, MDA could have conducted roughly five intercept tests for the over $1 billion it will expend trying to get a CE-II interceptor to hit a target. 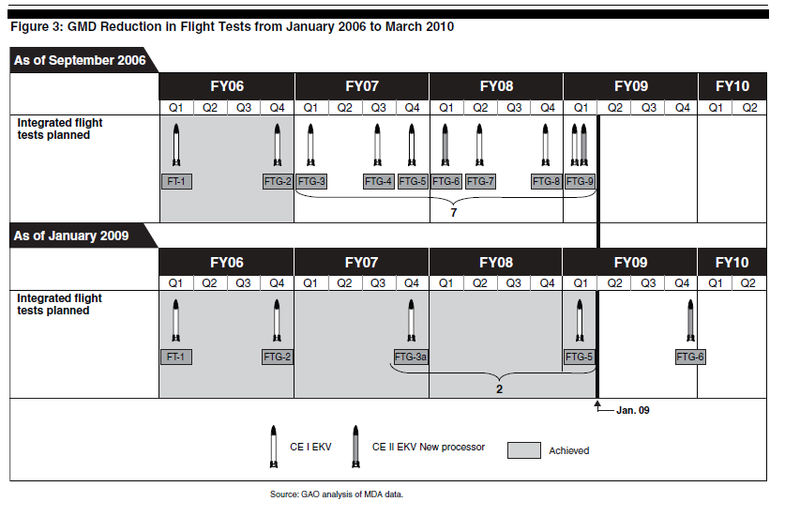 Moreover, as the graphic from the GAO below illustrates, the problems with the CE-II GBIs imposed at least a five and a half year delay in the GMD testing program. Figure 2. Figure from 2013 GAO Report showing at least five years of delay in the GMD testing program due to problems with the new CE-II GBIs. Click on the figure for a larger image. (6) The dramatic slowdown in planned GMD testing occurred in 2007-2008, during the second term of President George W. Bush. As the top part of the GAO chart below shows, as of September 2006 (following the reportedly successful FTG-02 test), MDA planned to conduct seven intercept tests (one involving two interceptors) by the end of calendar year 2008. However, as the lower part of the chart shows, only two tests actually were conducted by the end of 2008. Moreover, the third test in the lower part of the figure, FTG-06, which is shown as planned for FY2009, did not actually take place until 2Q FY 2010 (and it failed). Thus the slowdown in GMD testing the letter from the Republican Congressmen complains about was initiated during George W. Bush’s Administration, and at a time during which GMD spending was still relatively high. Figure 3. GAO chart illustrating the reductions that occurred in 2007-2008 in the number of planned GMD tests through FY2010. Click on the figure for a larger image. See, for example, Government Accountability Office, “Defense Acquisitions: Production and Fielding of Missile Defense Components Continue with Less Testing and Validation Than Planned,” GAO-09-338, March 2009, p. 1. Available at: http://www.gao.gov/products/GAO-09-338. Strategic Forces Subcommittee, House Armed Services Committee, March 31, 2011. Government Accountability Office, “Missile Defense: Opportunity Exists to Strengthen Acquisitions by Concurrency,” GAO-12-486, April 2012, p. 77. Available at: http://www.gao.gov/products/GAO-12-486. Government Accountability Office, “Missile Defense: Opportunity to Refocus on Strengthening Acquisition Management,” GAO-13-432, April 2013, p. 96. Available at: http://www.gao.gov/products/GAO-13-432. George – appreciate the effort to document the resource decisions and de-politicize the current finger pointing. If those gentlemen actually gave a rats ‘rear end’ to defending the american public from accidental / rogue missile launches – they should be pursuing those things that Congress can and should do regardless of the administration. 1) Holding Congressional hearings as to whether or not DOD is actually serious about BMD. – reexamine the rationale for MDA, its difficult to see what has been accomplished by a purple agency vs service programs since no useful cross-tell appears to be in play. I certainly cannot defend the technically pathetic GMD interceptor and its record on the test range. The NAS/NRC recommendation to scrap it and do a properly disciplined engineering development to replace it was a very moderate and appropriate recommendation. Realistic testing of a properly configured BMD program is well within reach; some of Yousaf’s suggestions could be employed. I suggest going further; incentivize a separate targets team to penetrate the system under test. Use live high explosives on the target and deliberately target the place where the contractor management and BMD program management are mandated to view the test to apply a Darwinian selection criterion to assure they are properly motivated to get it right. Politicians advocating the primacy of contractor concepts are encouraged to share the same viewing stand. I strenuously object to the quasi-religious invocation of the impossibilities of discrimination that Yousaf invokes from uninformed (1999 NIE) and untested (2000 UCS) efforts. Countermeasures to BMD systems were the principle focus of the ABRES and Chevaline programs with tens of billions spent over 3 decades. Stop preaching, get a clearance and look at exactly how hard BMD CM’s are to build and how poorly they perform in flight, CM’s don’t credibly prevent discrimination by a competent BMD sensor suite. Fundamentally; the topic for debate is whether or not the people of the US desire a BMD capability against accident or rogue attack; if yes, stop messing around with contractor marketing dreams and just do it the old fashioned way – use competent engineering practice. I’ll keep it brief. Capabilities based acquisition doesn’t work. MDA follows no guides or standards whatsoever. In fact, Gen O’Reilly said so in an MDA all-hands meeting last year. All the standards are “out of date” he said, and that MDA was on the cutting edge of defining new ones. Debatable. That is to say, MDA does not follow DoD guidance or standards. At least not strictly.